It’s Try-It! Illinois Time! Don’t know what this is? Read on! Do you live in Illinois? 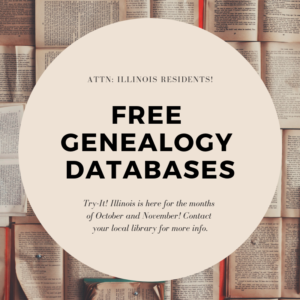 You might be able to access genealogy databases for FREE during the months of October and November! Try-It! Illinois is sponsored by the Illinois Secretary of State and State Librarian, Jesse White, as well as the Illinois State Library. It offers library users the opportunity to discover and evaluate a wide variety of online databases. The genealogy specific ones are Fold3 (military records), Chicago Tribune Historical archives, Newspapers.com, MyHeritage Library edition (similar to Ancestry) plus many more! So how do you access these great resources? First, contact your local library and ask for the Try-It! login and password. Then go to http://finditillinois.org/tryit/. After you have logged in, click on SUBJECT and scroll down till you see Genealogy and Family History. Pay attention to the specific log-in instructions for each database you choose.